I'm getting all excited with the Mars Science Laboratory getting ready to land, and as often happens with excitement in the 21st century, I went on an Internet binge of information consumption. One part of this passing obsession was wondering how similar other planets or moons in our solar system are to Earth. 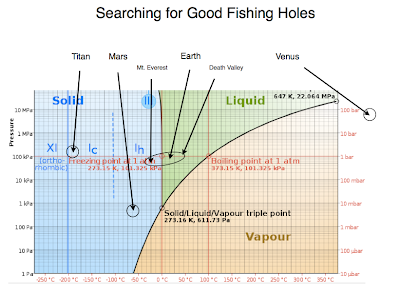 In my curiosity I created a graph on the critical aspect of living extra terrestrially, water. You can see that the range of tolerable conditions for us on Earth is far less than the range of possible conditions. The reason Mars is so interesting is that in a deep enough valley, the pressure is probably high enough to support liquid water, even if the temperature is not. That means a few things, we might just be able to grow plants there. We would probably need heating lamps and irrigation, but the ability to have liquid water is really the key. The ability to have liquid water totally changes the spacesuit requirements. 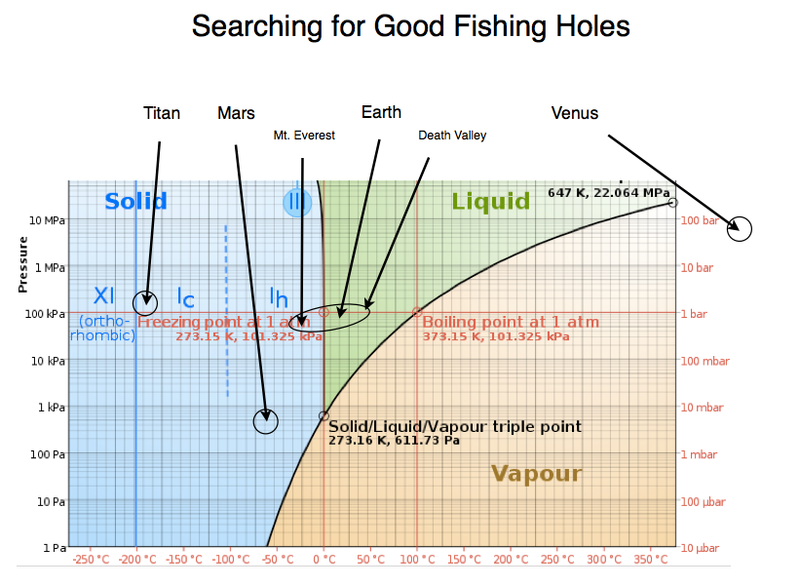 In other words, if the pressure was high enough for liquid water space explorers could wear equipment more like what is done on 8000 meter peaks with an oxygen mask and insulated clothing. In that scenario they actually could take off a glove and touch Mars. Of course everywhere we have been thus far if you took your hand out of the glove you would risk damage (6). Titan is interesting because it's all the way out at Saturn, and thus very very cold, but the pressure is close to the same as the Earth. All you would have to do it turn on the heater once you get there, just don't lite the atmosphere on fire! In summary, there are a few different interesting objectives to go take a look at. Who knows? We might just find something or learn something that was worth taking the journey.